Welcome to our one-stop coffee shop – For quality Coffee from the UK’s leading providers including Coffee made ethically sustainable sources and Fair Trade providing some of the world's best coffees like Kenyan Coffee, Ethiopian Coffee Beans, Burundi Coffee, Rwandan Coffee, Tanzanian Coffee, Ugandan Coffee, Zambian Coffee - packed full of intensity. Which is the right choice for you ? Did you know Instant coffee is made using roasted coffee beans?. Typically producing instant coffee involves grinding and brewing then dehydrating the beans to make Instant coffee going through this process typically means this contains less caffeine per cup than ground coffee. Are there positives to using whole coffee beans? Coffee in its bean state tends to stay fresher longer. However, once coffee is ground it will start to lose freshness and fragrance and does not store well once freshly ground. For best results, grinding whole beans up before brewing your coffee will give the best experience. See all items A range of coffee pods and capsules for use with coffee machines. See all items Enjoy a delicious brew on the go with the range of Coffee to Go. See all items View the range of Decaf Coffee products available for purchase here. 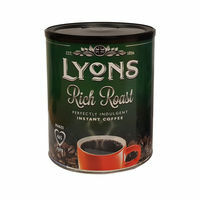 See all items Make a quick brew with the range of Instant Coffee products available.